Samsung Galaxy Note Price in India Rs. 34,000. 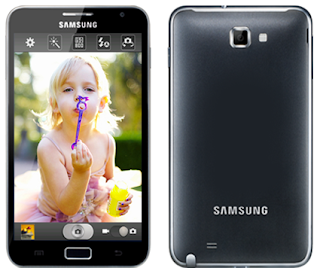 Samsung Galaxy Note Price in Mumbai Rs.34,000. Samsung Galaxy Note. It is a giant Smartphone by Samsung. It has 5.3" Touchscreen, it running on Android OS, Dual-core 1.4 GHz processor. Display resolutions 1280 x 800 pixels, Advanced Digital S Pen Technology, Dimensions 146.5 x 82.95 x 9.65 mm, Wireless LAN WiFi Direct, Camera - 8MP with LED Flash, and 2 MP Front Facing Camera, 1 GB internal memory up to 32 GB, Weight - 178g, 1080 P Full HD Video recording and playback, Video supported formats - MPEG4, H.263, H.264, DivX, WMV, Audio supported formats - MP3, AAC, AMR, WMA, WAV, FLAC, OGG, 3.5 mm Ear jack, Stereo FM Radio with RDS.